We offer shipping to all areas in Malaysia, NOT included hotel/guesthouse room and. Do ensure that address is stated completely and correctly, only 1 delivery address per order allowed. RM10 standard shipping fee for each order. FREE SHIPPING on orders over RM100, where it is not transferable or redeemable for cash. Strictly NO refund for any shipping & handling fee. All the parcels are dispatched and delivered by our courier partners. Once your shipment is ready for dispatch, courier tracking number will appears on MY ORDERS - Shipping Info, besides receiving a SMS notification. If you have not seen a status update of your delivery after few days, please contact us at eshop@giordano.com.my for further assistance. We promised to process confirmed orders in the shortest time possible. We will ship out your order within 1-3 working days. In general, delivery time for major districts require 1-3 working days, where remote areas require 2-4 working days. However, delivery may take slightly longer than usual lead time during peak sales/festival periods, due to heavy surges in online orders and courier partner handling capacity. We will make announcement in advance for relevant circumstances. ONLINE EXCLUSIVE ITEMS will be shipped from overseas, additional 7-14 delivery days required. Sorry for inconvenience caused. Parcels are delivered by courier partner on working days between 9am-5pm, no delivery on weekend and statutory Public Holidays. At the moment of receiving parcel, you agree to inspect the parcel packing integrity before you or your authorized person signing-off the receipt of delivery. Refuse to sign for received parcel if you have found the seal is broken or any significant damage, contact us at eshop@giordano.com.my with any photo as evidence, if could. Giordano will not be responsible for any loss suffered due to the parcel being received by someone other than the recipient. Occasionally, orders are returned to us due to incorrect address or failed delivery attempt(s). If the order needs to be re-delivered, RM10 delivery and handling fee is needed. 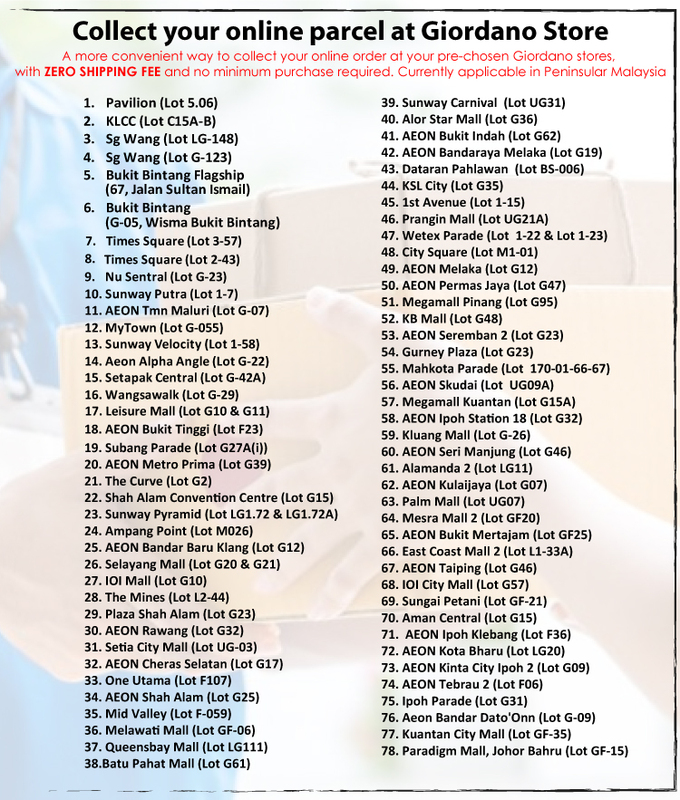 You may collect your parcel in Giordano Malaysia retail store, which currently applicable in Peninsular Malaysia. FREE SHIPPING for all instore collection orders. Once the parcel arrived at your selected store (Order status index as 7),you may collect it with 8-digits Pick Up Code given in Email/SMS notification or MY ORDERS - Order Status, within 7 days (for online payment) / 3 days (for instore payment). We could not entertain any request of change of store of collection once the order is confirmed. If you are not available for parcel collection, an authorized representative may collect on your behalf with Pick Up Code. Anyway, Giordano.com will not be responsible for any loss suffered due to the parcel being collected by someone other than the recipient. Overdue unclaimed orders will be cancelled. We do monitor the number of cancellations made by customers. Giordano.com reserves the right to withhold any delivery if have any doubts whatsoever as to your credit worthiness or insufficient identification.